Mirette set her eyes straight forward and ignored the cheering crowds behind her. Her concentration and balance were most vital at this critical moment. A single slip and she’d fall flat on the ground. She breathed in deeply, let her joints relax, and took her first step on the wire. Her arms wobbled slightly but her balance was maintained. She carefully slid her foot forward at a steady pace. The crowds roared beneath her and the loud speakers boomed above her, cheering her name. Just one more step and she’d hit home. One more step and her dream to cross the high wire would become true. As easy as it seemed, this one last step led to her downfall. As overconfidence hit its target, a gush of strong wind set her off balance causing her arms to waver and her left foot to slide off. She fell downwards. The crowd booed. I feel no different from Mirette Crosswire, the tightrope walker. Take away the cheering crowds and the loud speakers, my high wire challenge is just as hard as hers or even harder. For mine determines my destiny-Heaven or Hell. 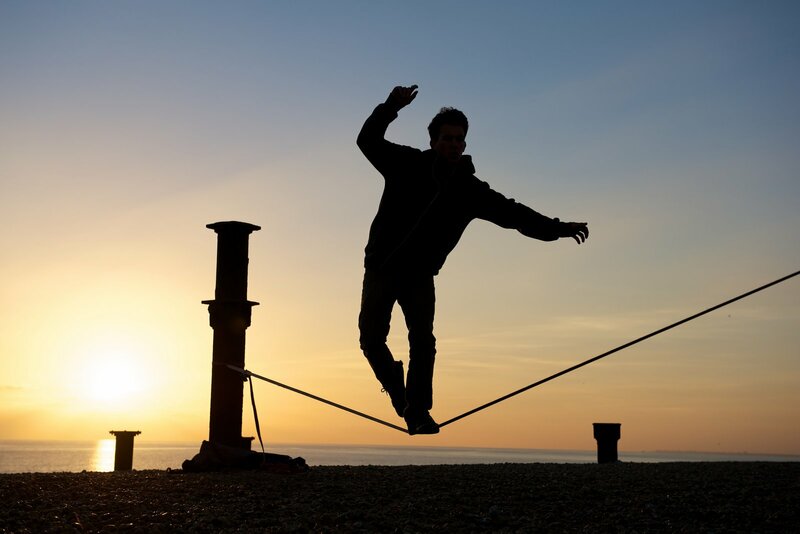 My feet cling on to the wire as tightly as possible as my hands attempt to balance while gripping on to my religion; a mission as strenuous as carrying burning, red coals. I trip time and time again but I must muster up the strength to get back up and renew my faith once again. To my right is a ditch full of temptations and desires, beckoning me to follow my whims. To my left is multiple paths full of misguidance and innovation, shrouding themselves under the guise of the truth. My only choice is to inch forward on The Straight Path. Every stumble signifies a decrease in my faith which must be patched up before it leads to my downfall. As I cautiously progress on the wire, my soul taunts me with the question: will I make it to the end or will I give up mid-way, throwing myself to destruction? This is dedicated to all those die-hard tightrope walkers who are pushing their way through the thorny path of life’s daily struggles and temptations to reach their Lord, purified and unscathed. Life is a balancing act so set your eyes ahead and inch forward. Hang in there and do not waver. Stay true to the path! And keep holding tight to the wire!